The integration unifies the Nuke Studio / Hiero workflows with ftrack. Centralized storage scenario or a custom location available and working. Note: Please avoid using previously saved presets as they change from each release and older versions are prone to break. It is suggested to remove the ~/.nuke/TaskPresets folder as well as removing all the tags from the project before running new versions of the integrations. 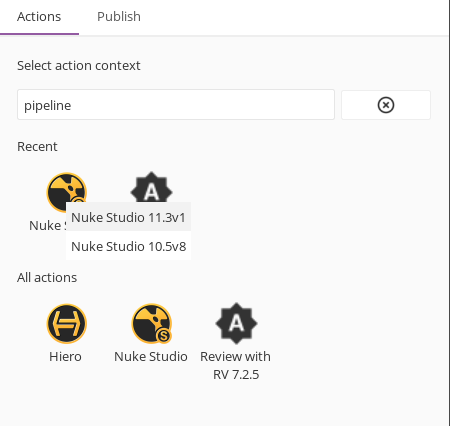 Once the application starts and your project is loaded, open the Nuke Studio Tags window and select the tasks from ftrack that you want to be created and drag them over to the timeline’s clip. Then right click and select Export. Once open, the usual Nuke Studio / Hiero Export interface will show. Selecting individual Tasks will show the properties and options, these will be customized for the integration at a later stage. This processor includes four default tasks. Each task will expose a Component name field which can be used to define the final ftrack component name output it will be published to. Will generate and publish a Nuke file containing for the selected clips. Will generate and publish a sequence of frames for the selected clips. Will generate and publish in the file system and as reviewable (mov) for the selected clips. Will generate and publish a wav file containing audio from the selected clips. Will generate and publish the current EDL from the project. Processors expose custom ftrack options, which can be used to define the exports behavior. Each template in the drop-down list contains a rule for parsing of clip names. Once matched, the correct entities will be created on the server. EP001_SQAA_SH010 will be matched as Episode with name 001 , Sequence named AA and Shot named 010. EP001_SH010 will be matched as Episode with name 001 and a Shot named 010. Match Sequence and Shot by underscore naming. SQ001_SH010 will be matched as Sequence with name SQ001 and a shot named SH010. Match SQ or SH and any subsequent numbers. SQ001_SH010 will be matched as Sequence with name 001 and a shot named 010. Match SH and any subsequent digits. Note: This process might take some time. The interface may appear to hang, an indicator will display the progress of the validation and project creation. The interface will allow you to pick from the available task types in the current selected schema and replace the wrong one. Or create a missing asset type defined in the processor itself. User will select existing project name from list. Once the Export button is pressed, the Processor will start executing the tasks for each clip. During this process, the project structure will be created on the server. Components will be populated when the tasks finishes rendering. An Asset version for each clip, containing a component for each Task executed in the processor. Note: The title area will reflect the amount of clips found based on the given settings. If no result is found the build button will be disabled. Once the Build button is pressed a new Video track will be built and show the imported clips. The integration supports clip versioning. Once the tracks are rebuilt you can click “V” to show the available version of the selected clip. As well as using the “version” context menu which allows you to check if any new version has been published and quickly jump between versions. After step four you should end up having a folder called build, under the ftrack-connect-nuke-studio folder containing a plugin folder and a zip ready to be installed. Note: If you want to develop and check quickly the results, you can otherwise symlink the plugin folder in build, directly in the connect’s plugin directory, so you can build on any change and restart connect to pick up the changes. The new integration will be output a log file in the ftrack log folder. If a problem arises, please ensure to include this file with your bug report and send to support@ftrack.com.